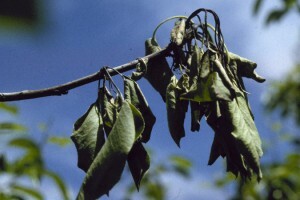 Fire blight is an extremely contagious disease that mostly affects Apples and Pears, but has been known to be problematic to other such fruits. Fire blight can be an extremely costly and tricky condition, to treat, combat and eradicate. The name of this disease comes from the symptoms on affected fruits. The affected fruit look as though they have been burned by a blazing fire. They become very dark in color, but resemble a burned look. Remarkably in a very short amount of time, minutes in some cases, entire orchards have been destroyed. It’s best to be extremely proactive, or act immediately upon detection of the presence of this disease. It takes extreme experience to successfully combat and treat this disease, to prevent the spreading of it, or stop it. The professionals at Kastle Kare, have a proven track record fighting and treating Fire blight disease. This is a disease that requires immediate action, and regular inspections to prevent costly damages.